Enmore Audio can cater for a broad range of audio recording requirements. Voiceovers, for example, can be completed for all kinds of commercial, broadcast or narrative scenarios, with speed and precision. Our Neumann M-147 adds a warmth and smoothness to the voice, which is perfect for intimate narration. The Shure SM7 or the ElectroVoice RE20 gives the voice that incomparable radio broadcast quality, with unrivalled punch and clarity. Sound recording is a fascinating combination of art and science. The ability to capture the best sound (or most appropriate sound) relies on a combination of factors. Choosing from an arsenal of microphones and finding the right position for those mics within a space. Enmore Audio meets all these requirements and offer a team dedicated to creating the best possible environment for your project. Those with experience will tell you that recording drum kits can be a challenge. There are many factors that must be considered when using multiple microphones in such close proximity (phase cancellation being of primary concern). Enmore Audio has the capacity in room size, microphone versatility and expertise to record drums to meet the artist’s requirements. The larger live space, The Garden is a supremely acoustically treated room, that allows for maximum flexibility in mic placement. For example, if the drums require a tight, punchy sound, we can close mic with our selection of classic dynamic microphones that have featured on many recordings. The aforementioned acoustics mean the engineering team can take a different approach as well, for example, a combination of kick, snare and overheads will be suitable if a more open, live drum kit sound is desirable. The Garden is also big enough to house more unconventional ensembles. If a record calls for additional parts outside of the band – perhaps a horn section or a string quartet – Enmore Audio can provide the environment for luscious, open-sounding arrangements. The challenge with recording horn sections is the unforgiving, brassy transient attack sounds that can be occasionally produced. For brass sections to find a home within an arrangement, they should be silky smooth and pleasing to the ear. Enmore Audio’s combination of ribbon and condenser microphones are perfect for this assignment. These microphone options are also perfect for capturing the lively, ambient sounds of string sections. The Stable is our smaller live room and is perfect for recording sounds with high fidelity, in an environment that offers flat frequency responses. Aside from being our ultimate choice for vocal tracking, the Stable does a more than suitable job at capturing electric, acoustic and bass guitar audio. Such a true listening setting has afforded us the opportunity to experiment with unique guitar tones through our selection of amplifiers and stomp-boxes. Artists are of course welcome and encouraged to bring along their favourite pieces of gear to use in our live spaces. Enmore Audio, in additional to the aforementioned microphone options, has a collection of inspiring instruments that are ready for your record. Drum kits and percussion, organs, pianos and even a Fender Rhodes. Guitars, amplifiers and stompboxes. 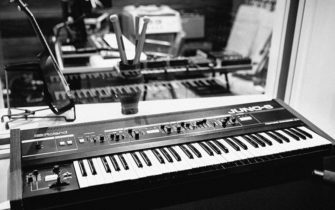 Synthesisers of established pedigree and even some very unconventional creations. Enmore Audio values experimentation in sound and encourages visiting artists to feel comfortable in their search for rare tones of their own. Enmore Audio is a great facility for recording sessions of all types. If you’d like to know more, or if you want to tell us about your recording project, get in touch with Radi or Dan.